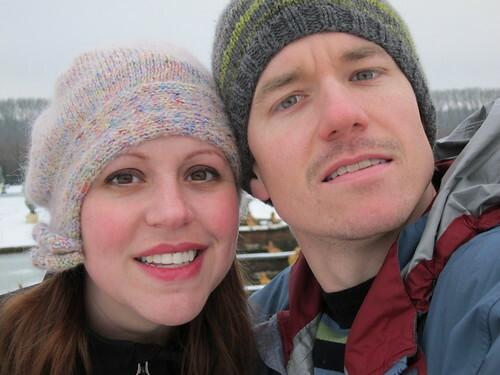 As many of you know, Will and I took a 2 week vacation to Europe over Christmas. We visited Paris, Strasbourg, Bruges, and Amsterdam. 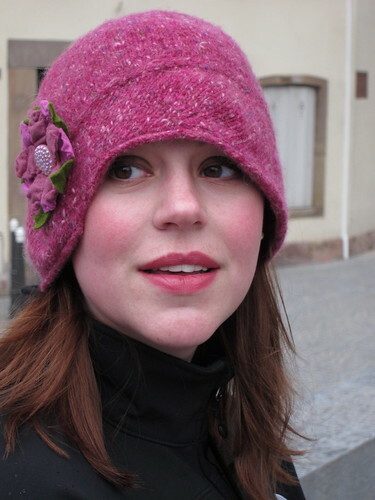 Since it was going to be cold (and we were going to spend the majority of our time outside exploring the cities) I decided to knit a hat for each city. Unfortunately Christmas crafting got in the way, so I only completed 3 of the 4 planned hats. I followed the pattern exactly and got a hat that I absolutely love. It's hard to see from the photo but there is a metallic thread that is woven through the yarn that makes this hat sparkle. I wore it all throughout Paris in snow, rain, and sun and it was just perfect. Small enough it easily fit in a jacket pocket but warm enough to ward out snow and rain and keep my hair dry. I've worn this around Minneapolis since we got back and one lady stopped me to ask where I bought it! I am tempted to make 1 more in a darker color . . .
Next: Strasbourg "Capital de Noel"
I lengthened the crown length a little so that it ended at the top of my ears as the pattern suggested. I also chose to knit the hemmed edge (which is very hard to see in the photo). Sewing the band and crown together to make the cloche style hat was a little tedious. I also decided to hand felted it a little to blur the stitches and shrink it a bit as the pattern suggested. Finally it had to be blocked over a large container of Clorox Wipes! The flower is made of felt from a Heather Bailey pattern I modified. I added the vintage glass button (from 195o's West Germany) for fun. This isn't a hat you wear in a strong breeze (it doesn't fit tightly against your head) but its fashion definitely makes up for any function it lacks. I think the sizing is a little generous - to make it again I would go down a size. I wanted something modern, monotone, and architectural for these two cities - and that is exactly what I got with this hat. My gauge was really off, so I had to downsize all 4 needle sizes called for (I used a 9, 8, 7, and 6). I also changed the hat construction slightly. After knitting the sides flat, I picked up and joined in the round to finish the crown. It was much faster than purling for stockinette and cut down the seam sewing quite a bit. 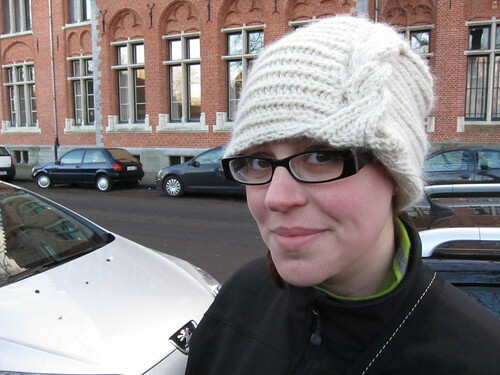 This is by far the warmest and thickest hat I had on our trip - which came in handy for the howling, rainy winds in Bruges. What about Will you ask? He had his own hat I knit last year (Turn a Square) but he did ask me to knit a new one for our trip. Time got the better of me and I was not able to finish it before or during the trip. It's sitting on the coffee table now and I'm hoping to get it done soon since it's -10oF outside! If you're interested in seeing more pics from our trip check out my flickr site. Love the Tillie hat. And what a great photo! Ooooh! I love the second hat best and I must compliment you on your makeup. What blush and lip color is that??? Lovely. Lauren - lips: Covergirl lipstain in color 405 or 440 (can't remember which one) as a base with Clinique Deeply Rose lipstick over it. Blush - I wear "Flowers" from Bare Escentuals, but I think most of my flush in this picture is from being outside for half the day! The hats are so cute! My favorite is the 2nd one too!